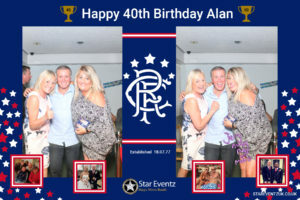 On Saturday 15th July 2017 we bought the Magic Mirror Photo Booth to Ilkeston, Derbyshire to celebrate the 40th Birthday of Alan, a close friend of Star Eventz! Alan has been a close friend of ours for over 20 years and he loves to party, when we were told that he was throwing a party we were naturally thrilled as when it comes to having a party, nobody does it better than this family! The original event with the magic mirror was pencilled in for Ayrshire Scotland where Alan now lives with his wife Elaine and son Rocco. However, nearer the time the event was moved to near Alan’s family home which is Ilkeston, Derbyshire. The event was held at the Manor Health and Racquets Club were the family have held many parties in the past. 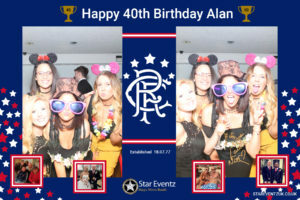 The Magic Mirror Booth was a little surprise for him organised by Star Eventz and as Alan is a stickler for quality and getting things right I had to deliver a photo booth experience that he and his family would remember forever. The actual event was situated upstairs and there was no lift so the first challenge was how to negotiate all those steps at the beginning and end of the night. Luckily we had visited the site a few weeks before the event and liaised with the club manager Annette Hayden to establish a plan. 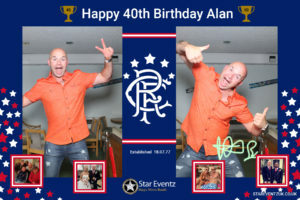 The theme was an obvious one as Alan is a huge football fan and an avid Glasgow Rangers follower. This meant creating a template to reflect this and the result was fantastic. It was welcomed by most and loathed by others but that’s football. Once set up the guests were first fascinated about the fact it was an elegant looking Mirror but once they saw what it did it kept the guests entertained throughout the whole evening. The staff and DJs were very helpful and all very interested in the Magic Mirror even having their photos taken too. The props went down very with people offering money to keep some of them as they liked them so much. The night was an enormous success and many people attending asked for our business cards so they could book the Star Eventz Magic Mirror Photo Booth for their events in the future. The venue itself was great with good amenities and in a suitable location. We look forward to working with them in the future. There was a great selection of music played by the DJs to entertain the guests, everything from Motown to Deep house was played adding to the momentous evening. We also had a guest book for all the guests to sign and leave personalized message in on the day and to place their favourite images of the evening alongside. Red carpet and rails were also used to add a VIP feel to the event. This was a great evening shared with some amazing friends and we got a lot of positive feedback and swapped contact details with many guests at the end of the night.